Premiere writes a lot of temp files to various locations – the most obvious of those are saved at the same location as the current project, in a folder simply called Adobe Premiere Pro Preview Files. If you delete an old project, make sure to delete this folder too. 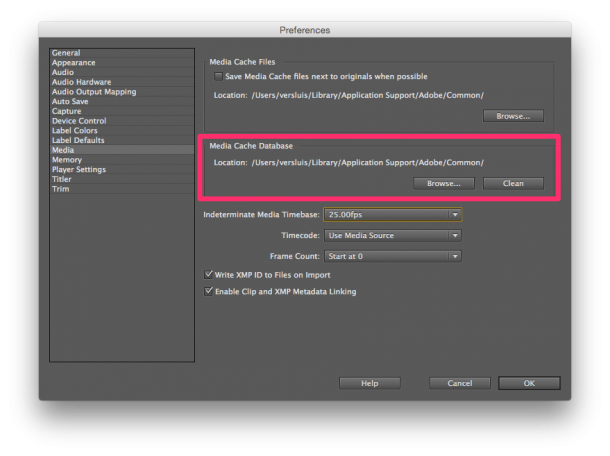 But Premiere does create temporary files in another location too, it’s called the Media Cache Database. I’ve found as much as 50GB in it at one point. I’m not entirely sure what Premiere is putting there, but it is nice enough to tell us where that cache database is located: head over to Preferences – Media to find out. There’s the location, and a convenient CLEAN button we should press regularly, especially because by default this location happens to be on the system drive. To avoid running out of space, feel free to use another drive for the cache database (via the browse option). Thanks to Jan Ozer for this tip!